Giclee fine art prints, Toronto digital art prints gallery. The best computer art show. Fine-art giclee printing for artists, photographers, digital designers, and illustrators. Giclee fine art printing technique has become very popular in the past decade among fine and digital artists, photographers, illustrators, galleries, and publishers. The main advantage of this technique is that it does not cost you a fortune just to reproduce your own artwork. It is on-demand printing that is individually produced so there is no need to produce a massive edition of prints like in lithography or silkscreen techniques. You can order one print at a time and enjoy much better quality! Our Giclée Epson Stylus Pro printers use high-end archival inks that make the archival properties of Giclée's much superior than lithography prints. These are among the most exact, most archival prints available anyplace. We use Epson printers to create the best computer art prints from either your original work or a computer scan of it. File preparation services are available for photographers, designers, and artists who have digital files. Image can be printed on a variety of types of media, from canvas to watercolor paper to archival adhesive paper and are superior to other types of prints. The range of color and the depth of the details for Giclée's prints are far beyond then that of lithography. The secret of the new printer is the combination of the Archival Pigment Inks and Archival paper that collectively ensures light fastness for over 100 years and up to 200 years in ideal lighting conditions. If you require some, but not all of these services, please call us for an estimate. Need a Certificate of Authenticity with your print? Ii is optional, but it will certainly help to validate a high price on your Limited Edition Giclee Print. It provides information about Copyrights, and other attributes of the limited edition like image title, size, number in the edition, publisher name, media, printer name, release date, etc. We provide the fine-art printing service at fair and reasonable prices. 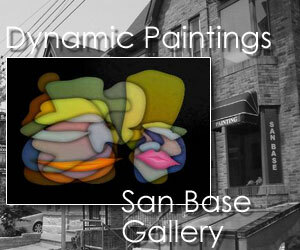 We are located in downtown Toronto digital art prints gallery, Ontario, Canada. Bay St. & Bloor W see map.. High-quality limited edition prints on canvas, signed and numbered by the artist, offered with a certificate of authenticity. Using the latest in computer technology, a still picture is transformed into a never-ending show. None of the images repeat previous ones and will never repeat again. The picture living its own life with objects moving and transforming but still following the original artist's concept. New dimension to traditional Art. Images replacing each other month by month, day by day, hour by hour. to inquire additional printing info. Q: What is a Giclee art print? A: The term giclee was introduced by Jack Duganne to represent fine art prints created using archival inks and paper. Giclee prints can be made on archival watercolor papers, canvas, fine art papers and glossy & matte photo base papers. A: Properly matched inks and papers can last from 60 - 200 years under continuous lighting conditions. For some of the best data on longevity visit the most respected web . Q: If I want to bring in my files how should I go about it? A: Color accuracy between devices is always a challenge. The only way to ensure a consistent result from your file to the final print is to make a test print or strip of your file before going ahead with the final print. Files should be sized at 300 dpi however you may be able to go as low as 150dpi with good results. Q: Who uses this service? A: Artists, and photographers are the largest group using this service. Photographers printing directly from there digital files or negatives wishing to make archival prints and have the flexibility of a digital work flow prefer this method of printing as well. Other sizes and media are available; please call or email us and we will be happy to provide a quotation. The sizes shown include the borders around the image. Multiple copies of the same image can be printed onto a single sheet. Minimum charge on your total order is $50 before taxes. Giclee fine art prints, Toronto Ontario Canada. Fine art giclee printing for artists, photographers, digital designers, and illustrators.